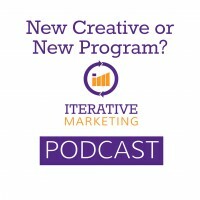 New Program or New Creative? New Creative or New Program? The definition of a program is a defined objective, for a defined audience, with no definitive end date. When the objective or audience changes, we should create a new program. The definition of a creative change is when the “bones” of the program stay static but the ad creative needs to be refreshed. Branding Creative – used to reinforce the brand in peoples’ minds. Not trying to evoke a measurable, response. Direct response – used to drive a response, gather and measure data. The truth is in the data when it comes to identifying when a creative change is necessary. If there are frequent changes in audience, there will be a lot of program changes. But, ad creative can last longer.